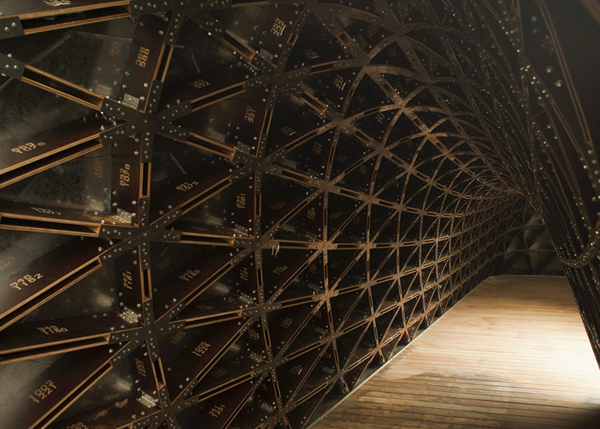 Flinders Street Station Design Competition has been burning topic in architectural circles these days. 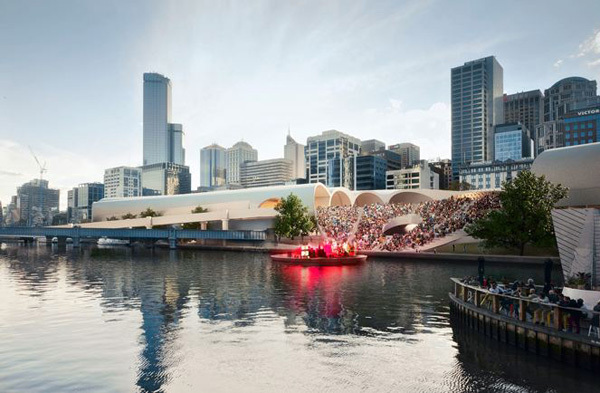 The site of Station is in the very center of Melbourne and is sandwiched between the Central Business District and the bank of Yarra River. The building of the existing station separates the city from the railway and from the river. Herzog & De Meuron’s proposal tries to keep the very specific linear use of this site, considering it a strong marker and urban element, while providing the architectural solution that would improve this very important location through public access and use of the entire site. 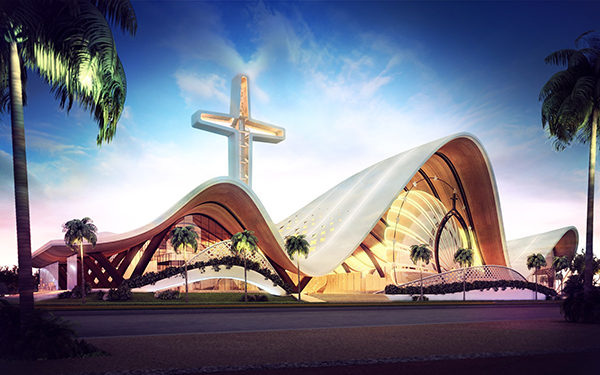 Various connections across the site and diverse public functions are only the part of the proposal. MenoMenoPiu Architects & FHF Architectes teamed up and designed this mega-stadium in Tokyo to be versatile in cultural use as well as versatile in visitor experience. Their stadium concept is a competition entry proposal of an elliptical spiral which gradually unrolls and forms the built space with a slope of 2%. This disposition aims to offer the public a perfect visibility from all of the gardens. The stadium and its neighborhood are an integrated part of the city. The entry and exit of the stadium are made through three different circuits— an eliptical ramp including an indoor and outdoor circuit serving different gardens, 16 elevator platforms (100 people per platform) for areas of 5,000 spectators, and stairs in each area of ​​5,000 people with 16 passage units. Thus, the stadium can be evacuated in 15 minutes. KK100, designed by TFP Farrells for Shenzhen, China, is an innovative project, located on a 3.6-hectare site, which previously housed the old dwellings of Caiwuwei Village, an area known for its bad environment, insufficient transportation infrastructure, and degraded buildings. The developer took the initiative to form a company with the villagers (a Joint Development Initiative), for a new model for the district that would benefit everyone. The existing buildings were mainly run-down housing with inadequate living conditions. A new pavilion, covered in galvanized steel plates, is constructed on a sloping lawn on the temporary Dover Campus of Singapore University of Technology and Design. Designed by City Form Lab in collaboration with ARUP, the shell pavilion is accommodating three mature trees and forming a buffer, a noise barrier toward the Expressway in the north. The outdoor space behind the existing library building is therefore activated. In daytime, the structure of the pavilion offers shaded open-air place to work, mingle or relax. During the night, the place becomes the spot for informal gatherings, event lectures and community events. The free-shaped temporary structure is a third space, between the classrooms and the dormitory, and the main place for spontaneous intellectual and social exchange. Due to its design and chosen structural principle – a catenary structure, the pavilion uses little material in order to achieve necessary spans while the canopy forms a lightweight timber shell, free of columns, beams and vertical walls. 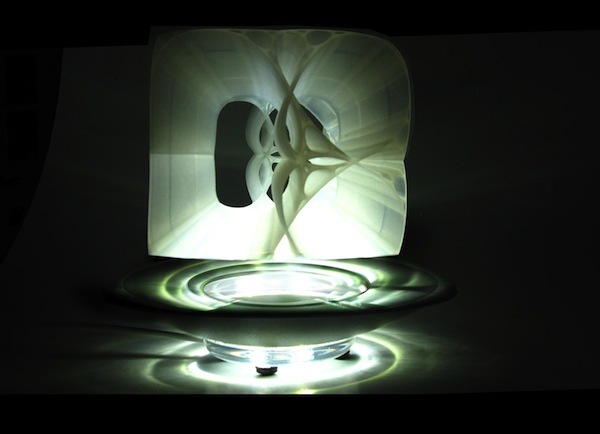 The double curvature of the form, which follows the lines of the compressed thrust, is enabled by hanging-chain model. 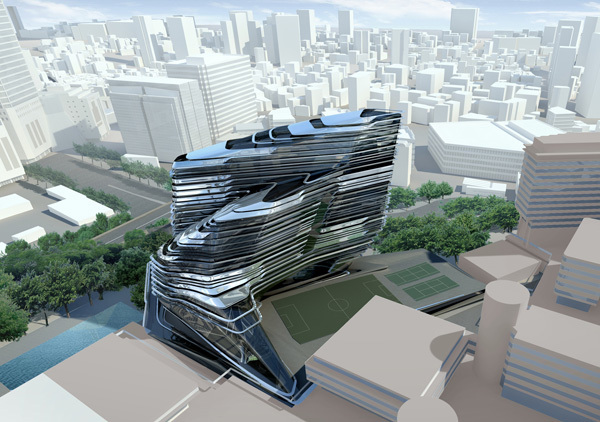 Zaha Hadid Architect’s Innovation Tower for Hong Kong Polytechnic University is near its completion. The architectural office was commissioned to design the architectural landmark that would symbolize the dynamic development of Hong Kong as Asia’s greatest design hub as well as the high level educational institution offering variety of design and research programs. 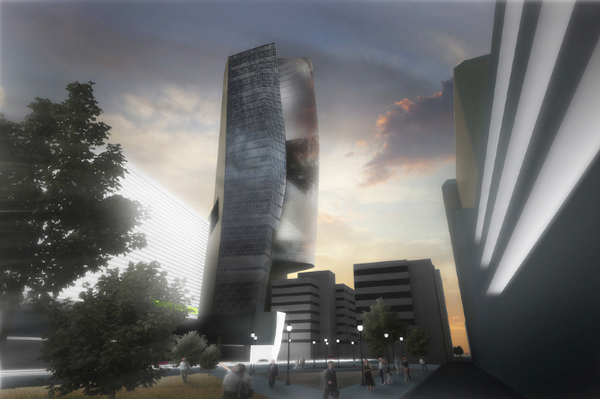 The design for the University’s Innovation Tower came as a result of the re-examining the characteristics and the requirements of such an institution and therefore the creative multidisciplinary environment called for something other than the classical typography of a tower rising from the podium – the design team proposed seamlessly fluid new structure. However, the tower still references University’s rich tradition, but with an accent on the upcoming, future achievements. 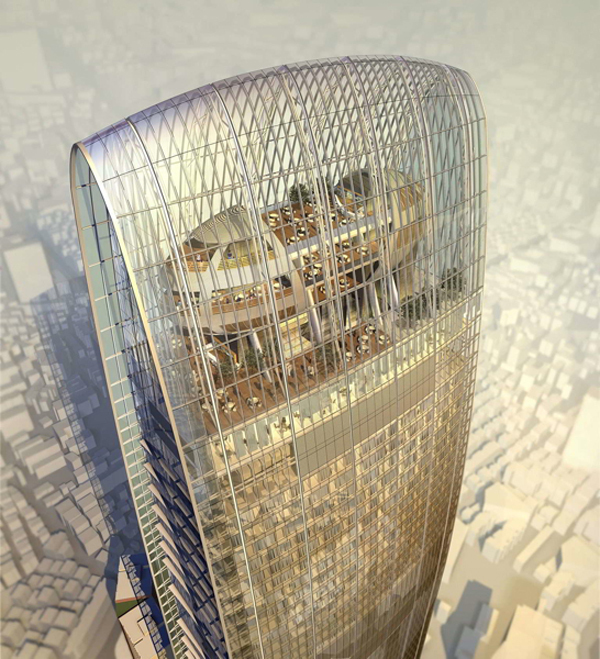 As it has been recently announced, UNStudio is commissioned to design Yongjia World Trade Center in Wenzhou, China. The winning concept by architectural team led by Ben Van Berkel proposes five towers, ranging from 287 meters for the central tower to 146 meters for the smallest. The towers offer traditional mixed-use, due to the fact that the residential apartments are located on top of offices of World Trade Center, therefore the users will experience 360-degree views. Located in the new riverside city of Wenzhou, the complex represents necessary functional shift of the WTC area from a business and financial district to a more sustainable, mixed-use development incorporating cultural and recreational facilities as well as residential layer. Live. Learn. Work. is a design by Brian Richter, created as a response to the recent expansion of Lexington, Kentucky. As the city is becoming a new regional urban model of a mid-size city center and being surrounded with many important public and private institutions and businesses with incredible cultural, social and economic potential, Lexington surely has the necessary intellectual capacity to attract new businesses that could take advantage of both the existing and proposed urban, social and cultural infrastructure. 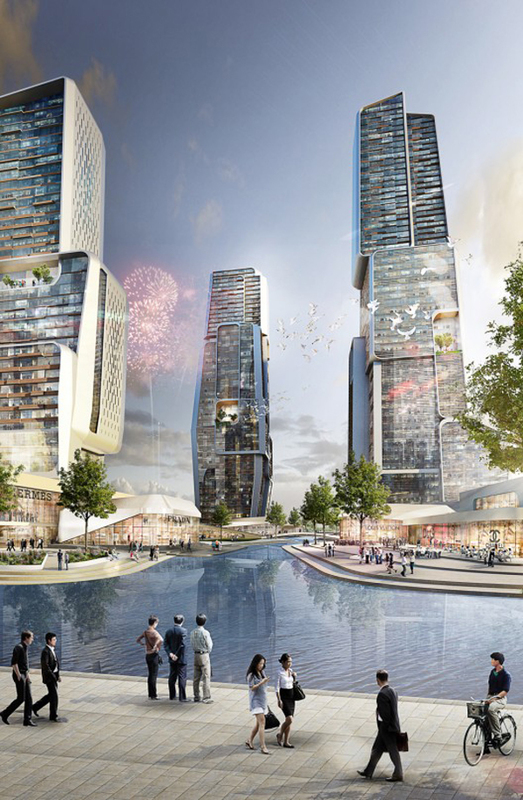 Dutch architectural practice UNStudio is behind the concept design for the new business district at Tongzhou in Beijing, China. 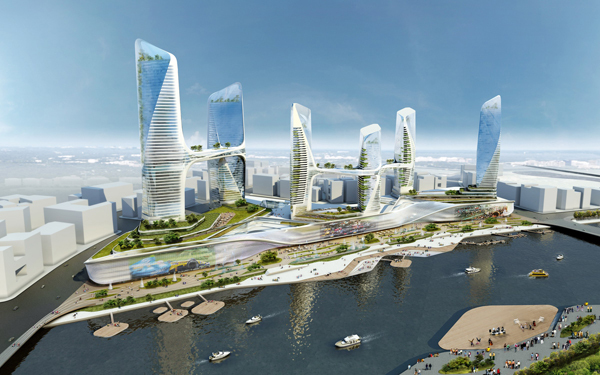 This waterfront development is rather dynamic composition of towers interconnected by aerial bridges and it introduces clear asymmetry in plan, orientation, clustering and façade treatment. The architects strongly believe that this asymmetry relates to users on a more personal scale, regarding its more natural character, while it also has a far-reaching urban effect.